The subtitle of “Implications of the Euro’ (edited by Philip Wyman, Mark Baimbridge and Brian Burkitt and published by Routledge, 2006) is “A critical perspective from the left”, and that is exactly what it provides. 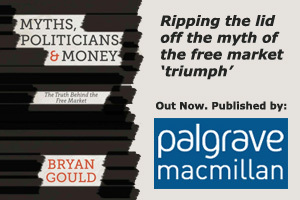 With a foreword by David Owen, and essays from academics like the editors and Jonathan Michie, politicians like Austin Mitchell and Tony Benn, and journalists like Larry Elliott, it is a long overdue and valuable exploration of the political and economic aspects of the euro from a left perspective. “This book is long overdue. The debate about Britain and the euro – so far as there has been a debate at all – has been largely the preserve of the right, and has been pretty much dominated by simplistic posturing. On the one hand, those in favour of British adoption of the euro have stressed the lower transaction costs and the convenience to travellers, and – if they are a little more knowledgeable – the familiar argument that to stay out would be to threaten trade and investment. The opponents, on the other hand, go for the nationalistic pitch, stressing the importance of national symbols like the pound and the Queen’s head on our currency. Neither side seems greatly interested in exploring the fundamental issues of economic and political significance that could help shape both Britain’s and Europe’s future. The left has hardly entered the debate, reflecting an unwillingness to be identified with either position adopted by the right, a broad but rather fuzzy commitment to internationalism, and an unthinking suspicion that exchange rates and currencies are properly the concerns of right-wing businessmen and technicians. Some – like the commentators – prefer to see the issues in terms of domestic and especially personality politics. Could Tony win a referendum? Or will Gordon use opposition to the euro to open the door to Number Ten? All of this misses the point – or rather several points. As a policy issue, the euro poses real challenges, and real opportunities, to the left. The careful exploration and successful resolution of these issues could determine the prospects of Labour governments for years to come. The economic consequences of embracing the euro can hardly be overstated. A single currency inevitably requires and dictates a single set of monetary conditions brought about by a single monetary policy. In an economic zone as large as the current European Union, it is inherently unlikely that a single monetary policy could conceivably meet the interests of all the diverse parts of that economic zone. A monetary policy that suits the stronger countries (who have the major say in what that policy should be) will harm the interests of the weaker, reinforcing the natural tendency in any economy for productive capacity to concentrate in the stronger parts. A single currency means the renunciation of one of the major (and potentially beneficial) instruments for dealing with this misalignment. Correctly aligned exchange rates allow differently developed economies to interact with each other to mutual advantage, encouraging each to move resources to the potential growth points where they enjoy a comparative advantage. With a correctly aligned exchange rate, a weaker economy can trade productively with a stronger one, with both concentrating on the things they do best. In the absence of that possibility of adjustment, inequalities do not disappear. They simply re-emerge in other forms. Those parts of the wider economy that find the going tough will experience a further loss of economic activity, investment and employment. The consequent fall in demand will in turn depress the wider economy, affecting even the stronger parts who were the initial beneficiaries of the single monetary policy. It is for these reasons that the United Kingdom’s decision on the euro is important for Europe as well as for the United Kingdom. A decision to stay out of the euro zone could be argued not only to be in the United Kingdom’s interests but to point the way to a better economic future for the European Union as a whole. The European economy would function better if component parts had the freedom to set their own monetary conditions and exchange rates so that they can trade with each other in optimal conditions. These arguments are not purely theoretical. The experience of European countries over the last twenty years (bearing in mind that the Exchange Rate Mechanism gave us an early test of the economic consequences of currency union) testifies to the damaging effects of compressing diverse economies into a single monetary and currency zone. It is no accident that the European Union continues to struggle while the United Kingdom has, by comparison and since leaving the ERM, prospered. In the absence of any possibility of exchange rate adjustment, there are only two escape routes for depressed parts of a wider currency zone. First, they can wait until a lower level of economic activity so depresses comparative living standards and wage rates that investment is attracted by those lower labour costs. The problem with this is that it takes a long time and that the loss of output while this slow and painful adjustment takes place will harm both the particular component part and the wider economy. This is, nevertheless, where the euro zone now is. Secondly, the depressed area can throw itself on the mercy of the wider entity, arguing that it is making a sacrifice of its own economic prospects for the sake of some wider goal, and that it is therefore entitled to all the benefits (such as they are) of the wider entity’s regional policy and, ultimately, social security largesse, in order to offset the loss of economic welfare. The wider goal for which this sacrifice is made is presumably a degree of political integration which is also the necessary pre-condition for the assumption of regional policy and social security responsibilities by the wider entity. It is only in a political union (and even then the strains are immense) that the parties recognise such a community of interest as to make possible both the sacrifice on the one hand and the assumption of responsibility on the other. The economic aspects of a single currency, in other words, inevitably elide into the political aspects. The deleterious economic effects of an inappropriately wide currency union can only be made tolerable – so it is calculated – if the parties agree to throw in their lots with each other to the point where the value they place on their common political identity outweighs the economic sacrifice. Those who do not dare propose such a step in its own right calculate that it can be achieved by a detour. Such a step remains, however, fraught with difficulty. We know from our own experience in the United Kingdom that even a long-established political union suffers huge strains that are only exacerbated by economic divergence. Major questions of concern to any democrat arise – issues of self-determination and accountability, representation and identity. Democracy is, after all, about more than voting. It means being governed by those by whom we choose to be governed.